This story starts, for us at least, with the low-level ache of an unresolved regret. In the mid-1990s Scott Jarson sold a hogan-inspired residence in the Carefree ranch highlands. Fascinating house in a really nice setting. The designer of the house, from twenty-five years back, ran Carefree Realty from an office facing Joe Wong’s sundial in the Carefree core. The designer’s name was Fred Griffin. Scott drove up to the office to introduce himself. After a quick conversation, Scott shook hands with Fred Griffin, turned, walked out on a friendly basis, meaning to follow up with him. “At the time we were headlong into our specialty and NO ONE else cared about architecture for sale in those days. Fred was super excited about what we were doing. Even his old Carefree Realty sign was cool.” Weeks passed. Scott had a passing idea that maybe he and Debbie should offer to buy out his office. Summer came then a year rolled around. Those possibilities gradually drifted out of reach; Scott didn’t know it when Fred Griffin died of a heart attack but he began to feel something unfinished. In the way that lost things bother you. “Those renderings haunt me.” Without any list of commissions, with only teasing clues about where and when, without even the bones of his biography or his training, with no sense of who Fred Griffin was. Frederick Kirkwood Griffin was born July 16, 1914, in Pittsburgh. His father worked for the Chesapeake & Ohio. That extra degree of mobility may partly account for Fred being located in Wheeling in 1928; graduating high school in Toledo in 1932 (we have a dashing yearbook photo) and spending at least two years at the University of Toledo; in 1938 Norfolk Virginia when his father died; in 1940 Norfolk Virginia at age 26, occupation “advertising.” There’s no military service. By January 1945 Fred and his mother, Lillian Frederick Griffin, arrived in Phoenix and were dealing in real estate, fairly extensively. By September 1951 Lillian and Fred lived at 73 West Culver, now an empty lot. This team is intriguing if not downright odd. Griffin was 36 years old with no trace of having been licensed in Arizona or elsewhere. The partner? The good news is E.E. Clepper was well-respected, designed a good chunk of the steel boom town of Sharon, Pennsylvania including the high school, two theatres, three big churches and a dozen steel bosses’ houses at least, was a legit co-founder of South Sharon (now Farrell) Pennsylvania, and started an architectural magazine with his brother. The bad news: all that happened before 1910. One of those two theatres was a Keith Vaudeville house. Griffin’s new partner was 80 years old and unfortunately died later that year. So much for Griffin & Clepper. Nevertheless in the 1950s Fred found his professional footing in Phoenix, and (critically) got published regularly. His personal life is another story. By April 1952 he was married to Jean B. Griffin, then by August 1953 there was an alimony judgment, and he was divorced from Jean no later than November. A November 17 1953 mortgage on land in Cave Creek shows him as “a divorced man.” A November 1954 document shows him married to Sally S. Griffin. Magazine coverage of one of houses in 1956 blandly mentioned that Mr. Griffin no longer lived in the state. The property settlement effective January 4, 1959 raises its own questions but makes it clear that Sally Scott Griffin and Fred Griffin have parted ways; that Wife is entitled to the property at 120 Filbert Avenue in Sausalito, California, all of her personal effects, $600 from Husband, repayment of a $20 loan from Wife’s mother, and “that certain dog known as Mr. Bon Bon” along with his vaccination and pedigree papers. Husband agrees to pay any remaining debts to the dressmaker Madam Yvonne Barbaux and return three pieces of purchased furniture to Murphy Contemporary Interiors. Husband will retain the title to the property in the Foote Addition left to him by his mother (she died in 1958), the 1957 Volkswagen Kombi-Camper, his mother’s jewelry, his books, paintings, power tools, hand tools, the black IBM typewriter, and his two Leica cameras. No mention of children, there or anywhere else. Thirteen months later magazine coverage of Fred’s design of his Foote Addition property describes it, with deadly accuracy, as a bachelor pad. (We’ll get to that in a moment.) The ironic touch in the article was that Fred had married again a week only before the article publication, the third time, a fact which exactly checks out independently. Fred married Ann J. McKnight on February 13, 1960. In Las Vegas. This style information along with some of Griffin’s design decisions strongly suggest that he was a designer, a visual artist, no engineer. With countercultural leanings. Footloose: Pittsburgh, Toledo, Columbus (we think), Norfolk, Phoenix, Sausalito, Phoenix. A Vegas marriage suggests a hurry of some kind. Kombi-Campers were an exotic species in 1957, in a period two years after the first U.S. VW dealerships opened, two years before the famous ads. At 45, he was no kid sitting in that Kombi-Camper. But once Fred married Ann, Fred settled. They were married for 38 years, through the ten remaining years of his active architectural career (about 1950 to 1970), then into the phase when he moved to Carefree, took his broker’s license, and opened a real estate office at 100 Easy Street in 1968 right beside the Sundial. Ann helped him in that office and presumably she helped him when he opened his Whiskey Row satellite office in Prescott in 1971. Old friends from those Carefree years describe them as devoted to each other. It was hard for them to imagine him married to anybody else. Without his papers, without remaining family we can find, and without any association with a larger firm or school, we’ve reconstructed Fred Griffin’s architectural career from scraps and fragments. They fit together in a brilliant, puzzling, and very entertaining way. Of seven solidly identified commissions one is, without exaggeration, a spectacular and successful act of originality, like nothing else I’ve ever seen before. At least four of the others are worth attention. That’s a great batting average. His work includes solid connections to local history, especially of Carefree and Cave Creek, and by the way provides an answer to a minor mystery that’s been bugging me for some time. Technically Griffin also counts as an architect with work listed on the National Register of Historic Places. He might have grinned ruefully at that. Because of this fragmentary evidence, there’s the teasing promise of more Griffin work to be found. Possibly underground. Even with only fragments to consider Fred’s choices and personality come through loud and clear. He had a sense of humor. And a sense of color. He was a drummer. It’s no accident that his productive years as a designer dovetail with the Phoenician boom years of explosive growth. Sure, that boom produced hundreds of thousands of drab instant tract homes, and a large number of fine custom-designed houses. More than that, the valley also became an open-air laboratory for outrageous ideas. All the conditions in boomtown Phoenix gave people a chance to experiment. Anybody could play. “Play” is the right word. The house that Fred Griffin designed for himself in 1959, the house on 26th Street, is objectively, scientifically, a bachelor pad. The current owners fully appreciate what they have. It has pained them to make some necessary practical corrections. Draining the alligator pond, for example. Those owners were actually out looking at a neighboring property in 2002 when the half-hidden bachelor pad made eyes at them from across the street, with a “crazy black wood fence, a really funky design”, an arbor with attached square panels in red, yellow and blue, a reminder of Mondrian. 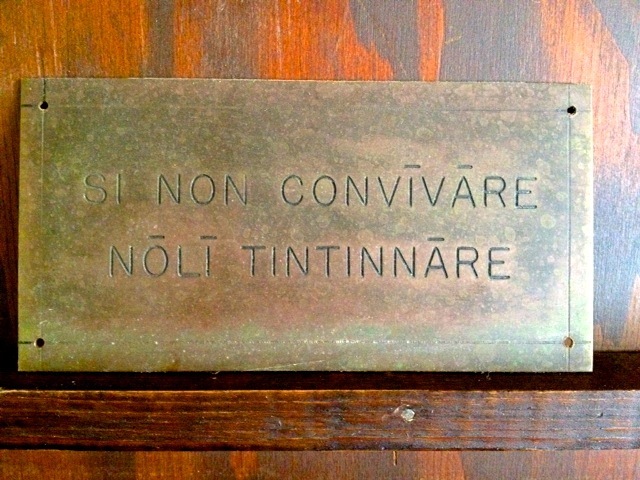 A word to the real estate agent, a closer look, an approach to the front door revealed a small bronze plaque that said…. The house is a long rectangle positioned along the northern edge of the lot, with all big south-facing windows. This oriented all interior views to a yard as large as Griffin could get it. Most of the yard was given to a large irregular irrigation-fed pond adjacent to the house, with a toy-like bridge. Alligators may or may not be a neighborhood rumor. Koi is a good bet though. An impressive collection of thick exotic plantings thoroughly shaded the windows: African Sumac, the waxy Japanese privet, sort of a vintage choice, and Australian bottleneck, among many others, with no grass. Some of these trees are sadly past maturity 50 years later, giving the owners some hard choices. The contemporary landscape guy had a look and said, “Oh, you had a mad scientist here.” The general feeling of a tropical / orientalist / bohemian private oasis is in pretty sharp contrast to the surrounding neighborhood, then and now. Inside, Griffin gave himself built-in shelves and interior planters, a built-in 12-foot sofa, an elaborate built-in sound system, Wrightian flourishes in the woodwork, and unusual decorative elements like a wall in the kitchen made from liquor bottles set in concrete. Now happily married in his bachelor pad, Fred Griffin’s restlessness moved him again within three years, but he didn’t go far. He became a founding father of Carefree. “Born in a restaurant,” the town of Carefree was conceived in 1946 in a conversation at the Adams Hotel between Tom Darlington and K.T. Palmer. Both men had been founders of the seminal Arizona Craft Center in downtown Scottsdale, and both were frustrated with Scottsdale’s civic planning decisions in the Malcolm White era. White was Scottsdale’s first mayor, the inventor of its western theme, and not coincidentally the owner of the giant neon cowboy at the Round-Up Drive-In on Thomas. To satisfy these problems they decided to start their own entire town. Why not? What better place? From the beginning Darlington and Palmer held to a conception of Carefree that was an unusual combination of urbanity in the middle of nowhere, isolated and sophisticated, white linen and stinging scorpions, a place that would be hard to get to and difficult to leave. Unlike most other places in the valley the town has retained much of its original vision. That must have appealed to Griffin. He got interested in Carefree as early as 1950, bought land in 1953, and was reportedly present at those parties where the developers and associates would knock back a few Scotches, loosen up, and think up loopy street names. You know, “Ho” and “Hum”, “Dream”, “Serene”, “Celestial”, “Rocking Chair”, and all that. The sundial went up in 1959. Sky Ranch Airport went up in 1961. Griffin went up in 1962. In those remote scrubby desert surroundings Griffin took the remarkable step of building himself a part-residence, part-sales-office, part-display-home, meant to attract attention from the street. A round house. They called it the Carousel House. Strictly speaking it’s not round. It has 36 sides, and is 27 feet in radius. There were colored disks on every face. The owners have been perfectly happy and comfortable with the Carousel House all these years since Fred moved out, and with its built-in furniture with a Wrightian sensibility, and its low half-circle concrete walls outside that define the adjacent garden. It’s in good shape. They took the colored disks down. They chose to remove the pool and waterfall that was really too close to the house. The elaborate built-in sound system still works splendidly. The owners believe that Griffin is also responsible for two or three underground houses in the area. They don’t know where, though. The next year, 1963, Griffin was the organizing force between the Desert Foothills Scenic Drive, the project along Scottsdale Road, north of Happy Valley and south of Carefree Highway. This was another promotional project, and the linear design makes perfect sense from the standpoint of drawing curious drivers up towards the north. Griffin designed the pullout informational display at the southern end, which is still there, and he also designed the roadside “flora identifying signs”. Any of us who have ever wondered about those enigmatic redwood signs along Scottsdale Road, wondering who would take the trouble to point out “Ironwood” and “Creosote” and “Manzanita” to passing drivers with just that faint echo of National Park sobriety, that’s Fred Griffin talking to you. Actually, he’s teasing you a little. By November 3, 1968, Fred had opened the offices of both “Fred Griffin Realty” and “Griffin City and Town Planning” at 7 Sundial Circle. At that time he was the president of the Cave Creek Improvement Association, Vice President of the Cave Creek-Carefree Chamber of Commerce, with county and state planning board memberships too. This much of Fred Griffin’s career might easily be dismissed as a speculator / developer / real estate agent who dabbled in architecture. The Bendheim house, a remarkable house for remarkable clients, puts him in a category that deserves attention. Dr. Otto Lazarus Bendheim had been born in Germany in 1911, educated in Chicago. He came west for the adventure and the romantic promise of it. As a young assistant psychiatrist living and working at the state hospital beginning in 1938, he’d been a friend and defender of Winnie Ruth Judd as she “escaped” from confinement twelve, fourteen, twenty times. In 1950 Dr. Bendheim founded the Camelback Hospital, that stood on a plum property, a square 10-acre lot at 5055 North 34th Street, from 1950 all the way up to 2001. Dr. Bendheim had a national reputation in the psychiatric field, he and his wife Ronnie were well-regarded to say the least, cornerstones of the Phoenix Jewish community. She was (and is) an accomplished ceramicist. Dr. Bendheim’s blunt, funny oral history with the Arizona Jewish Historical Society is well worth looking up. 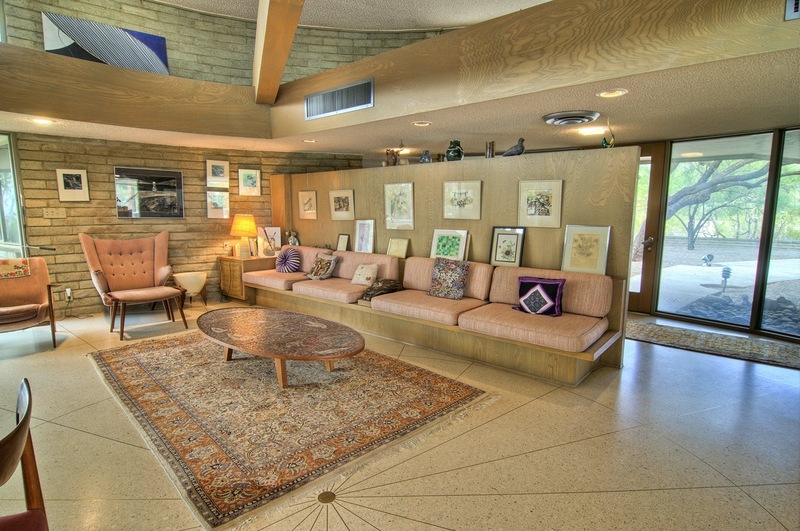 In 1962 Fred Griffin came to Ronnie Bendheim’s attention with a house on 28th Street, north of Indian School. In Ronnie’s words it had a Japanese aesthetic, “a sense of better-less-than-more”. No trace of that house remains today but it caught her eye. Maybe there were colored panels. They’d considered Frank Lloyd Wright a few years before but didn’t appreciate how he treated some of his clients. They chose to gamble with this non-registrant. The Bendheims laid out their requirements. This was a busy household. They had five children, two careers, and some serious social requirements. Fred Griffin responded with a large house of three ovoid pedals attached to a central circle, like an old three-bladed electric fan. One lobe devoted to bedrooms, one devoted to the kitchen and dining, the third for office and study, the middle for the hearth and meeting-place. Unusual to say the least. As if Griffin was seized with a self-destructive urge to draw an unbuildable shape with the maximum amount of surface area and unlimited potential for contractor error. Except it worked. Griffin made a model, the Bendheims were delighted with it, this difficult form was successfully built from slumpblock, and it worked. Ronnie continues to be delighted with it 50 years afterward. She fondly remembers that Griffin was likeable, easy to get along with, and helped her order furniture out of catalogs. As always there are Wrightian gestures, built-ins, and a water feature alarmingly close to the structure. There in the middle circular intersection there’s a lovely spatial moment of absolutely precise centrality, crisply marked like a compass in the terrazzo floor and marked overhead by a trio of intersecting beams. It’s a work of practicality, risk, and possibility whichever way you look. Fred Griffin died of a heart attack, aged 84, in October 1998, with his architectural career well behind him. 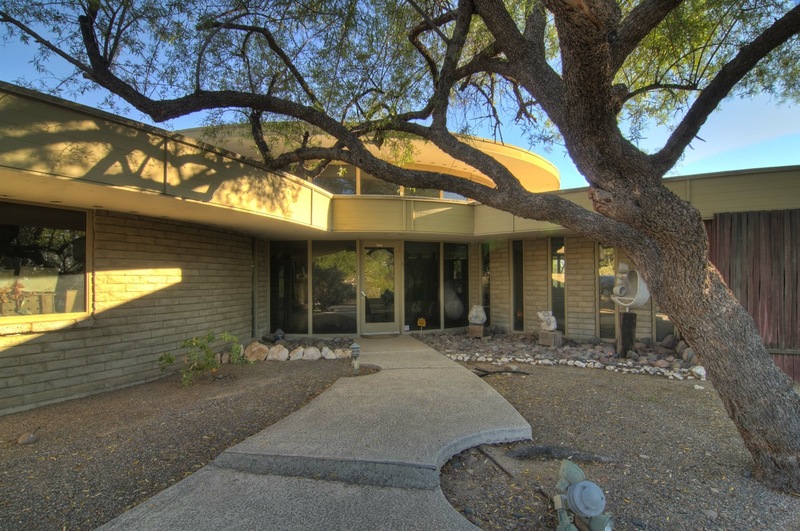 I’d disagree with experts who claim that 100% of architecture in the Phoenix area is ultimately derivative of Mies or Corbu. There was a strong streak of originality and independence here, trying to respond to the demands of this extreme environment, and certainly pushing back against any hints of east-coast or European paternalism. This same independent western streak helped to power the creation of the rubberized Airform dome houses in Litchfield Park, Paolo Soleri’s crude and subtle Cosanti, Frank Lloyd Wright’s desert think tank cranking out one bizarre wonderful notion after another for decades, the engineering magician Dr. Wendell Rossman and his amazing concrete shells, Frank Henry’s bank, and all those other experimental structures in the valley that look like the covers of science-fiction paperbacks. Griffin’s work looks good alongside those other wild improvisations. It’s that rocketship sense of imagination that makes him worth remembering. That’s what stuck in Scott’s memory all this time. We can learn from that. – Griffin Residence on Encanto Drive, 1953, on a difficult lot, published in Arizona Days & Ways on November 5, 1953. 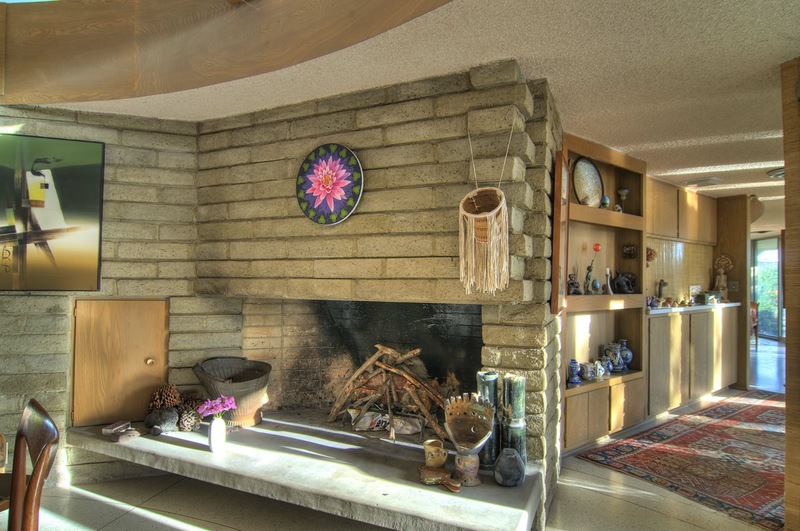 Stylistically there’s a 30-foot fireplace wall and custom built-in furniture. It’s been mis-attributed to Al Beadle. 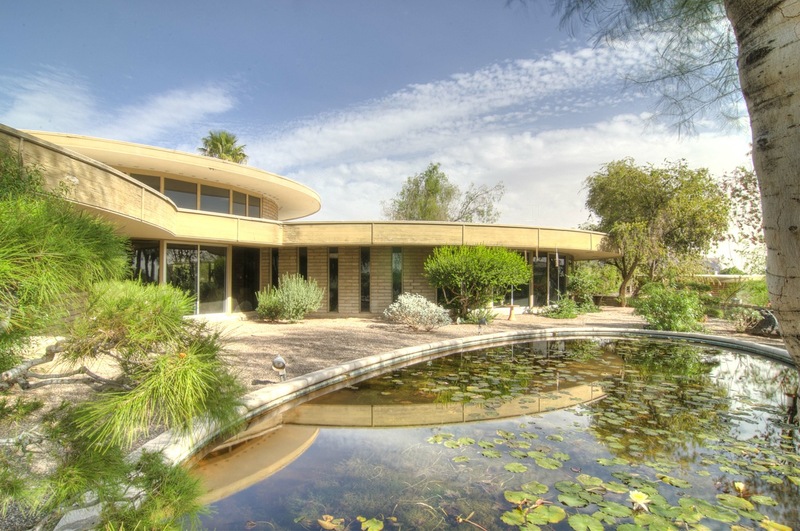 – Byers Residence in Tempe, 1953, is one of the 159 contributing residential properties in Tempe’s University Park Historic District granted NRHP status in February 2008. 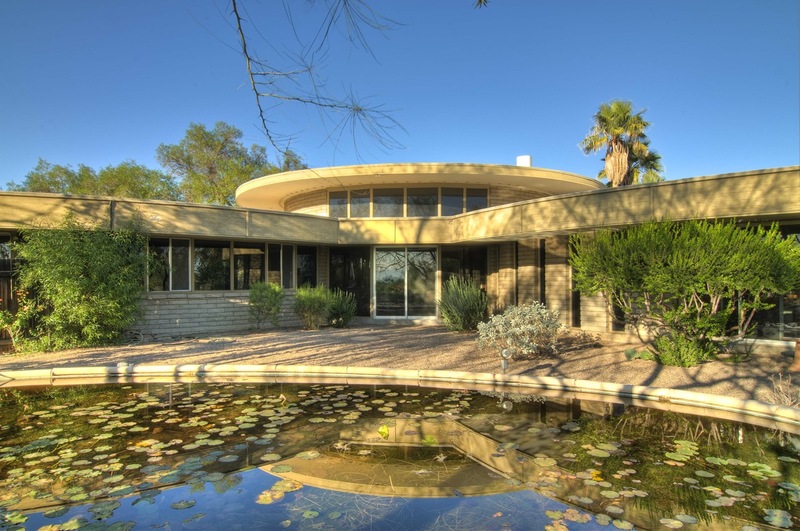 This technically makes Fred Griffin “an architect whose work is listed in the National Register of Historic Places.” Modest on the exterior, the house contains a broad hearth, a walled-in patio and cactus garden with unusual plantings, and experimental colored lighting. The similar 1956 house across the street shares some of its characteristics. – “Paraiso deserto,” the Peterson House a bit west of the Mountain Shadows property, 1955. 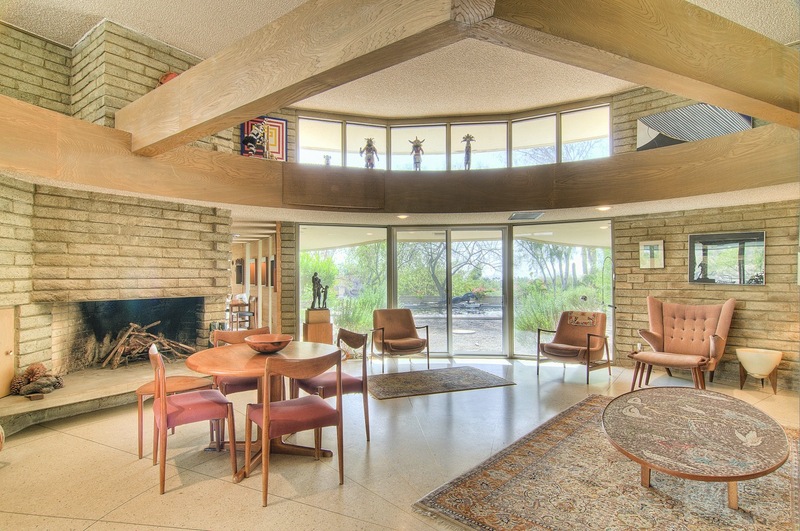 Also published in Arizona Days and Ways, the floorplan of “Paraiso deserto” has a fascinating single curved wall on its western side, with geometric ornament in the Superlite block work, and eaves carefully calculated to let in winter sun, keeping summer sun out. 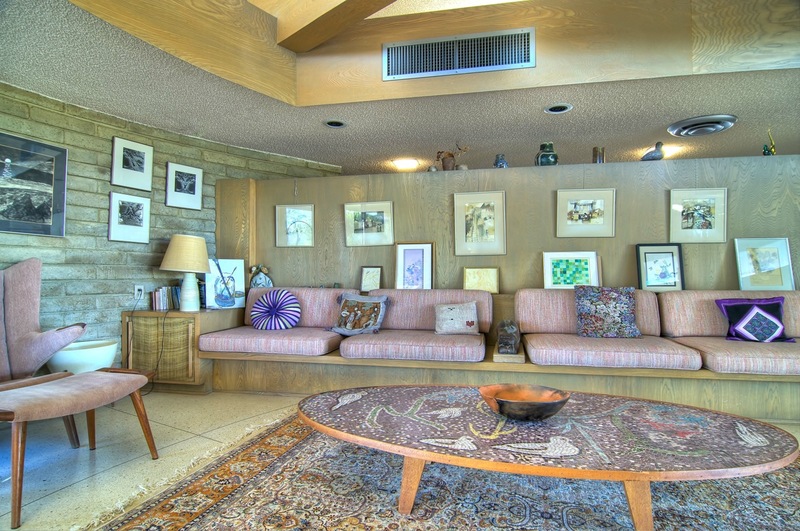 A distinctive pattern of metalwork links this and the 1959 bachelor pad. Possibly two adjacent properties, to the south and to the west, were also Griffin’s designs and once connected. – Redewill Residence, 1958, at 1625 North 3rd Street, now the Saint Germain Foundation property. Mary and Gene Redewill were notable Phoenicians in the first half of the 20th Century, owners of the Redewill Music Company. Per architectural historian John Jacquemart, Griffin renovated and expanded an original 1935 house for the couple, a large conspicuous project. It’s been altered since. – the Bachelor Pad, 1959, discussed above. 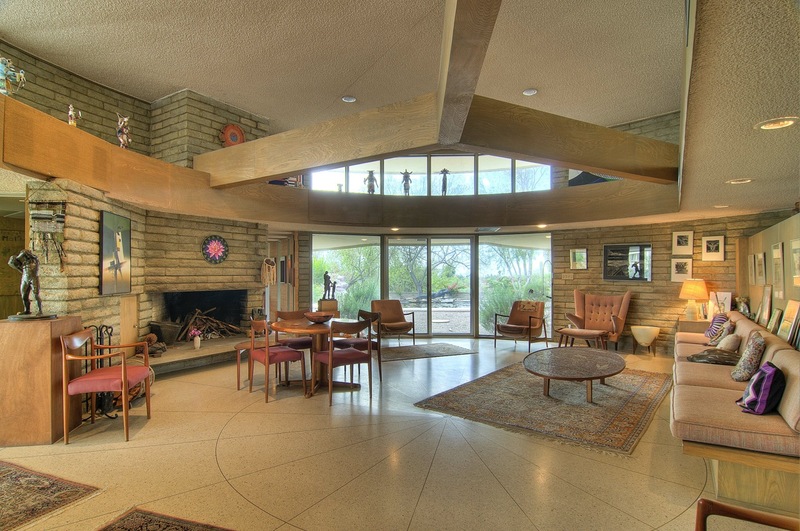 – the George Gavin Residence, 1960 or prior, with a “super modern triangular fireplace flanked by large built-in speakers” as published in Arizona Days and Ways. Unlocated. – the Carousel House, 1962, discussed above. – the Bendheim House, 1963, discussed above. – design work for the Desert Foothills Scenic Drive, 1963-64, discussed above. – the Westphal Residence in Carefree, 1970, a hogan-inspired design. Razed. – Sundial Garden Cafe – per local sources, Fred Griffin designed 11 Sundial Plaza, date unknown.